Gather series is turning two years old! While normally housed at Comfort Station Logan Square, Gather is partnering up with Elastic Arts Center to close out its 2018 season with an amazing series of performances by Blackerface, Katinka Kleijn, and Lykanthea with Hanna Brock and Lia Kohl. Proceeds from this event go directly towards Gather’s 2019 programming. 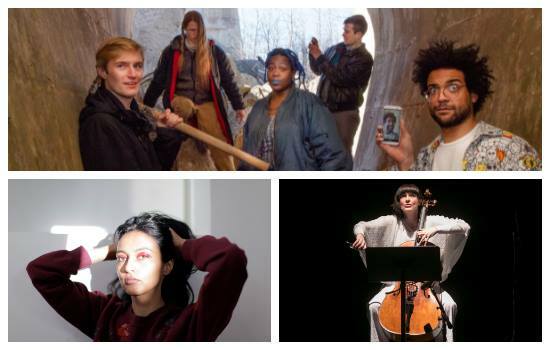 Gather is an experimental music series bringing musicians from different scenes, backgrounds, practices, disciplines, and communities together for connection and artistic exchange. We curate this series with our attention toward introducing musicians who may not otherwise cross paths and whose works dialogue in compelling ways. By doing so, we hope to leave potential for collaboration and familiarity amongst different experimental music forms in Chicago. Gather is curated by Allen Moore, Nick Meryhew and Rebecca Himelstein. Two black gadflies, three white maggots. Photo by Michael Egon Schiele. Cellist Katinka Kleijn enjoys a genre-defying career in solo, chamber, improvisation and orchestral performance. As soloist she appeared with the Chicago Symphony Orchestra,The Hague Philharmonic, and premiered Dai Fujikura’s Cello Concerto at Lincoln Center, which was released live on Minabel and Sony Japan Records. Known for her innovative individual projects, she appeared in recital at the Library of Congress, Carolina Performing Arts, and the Chicago Humanities Festival. A collaboration with the performance art duo Industry of the Ordinary resulted in “Intelligence in the Human-Machine”, a duo for cellist and brainwaves. Kleijn recorded David Baker’s Cello Concerto with the Chicago Sinfonietta, as well as with District 97, Relax Your Ears, Ryley Walker, and has a working duo with guitarist Bill MacKay. A member of the Chicago Symphony Orchestra and the International Contemporary Ensemble, she teaches at Roosevelt University and University of Notre Dame. Over the last four years, the work of Lykanthea’s Lakshmi Ramgopal has transformed from explorations of electro-ambient pop idioms into expansive performances and installations. Her debut EP Migration garnered praise from Noisey, Chicago Tribune, and Public Radio International’s The World for its alchemy of synths, catchy melodies, and Carnatic improvisatory techniques. The record led to a European tour, Leipzig’s Wave-Gotik Treffen, and an opening performance for the 50th anniversary celebrations of Chicago’s Museum of Contemporary Art, where she shared a bill with Billy Corgan, Lupe Fiasco, and Jamila Woods. Amid all this, she completed a PhD at the University of Chicago and teamed up with Paula Matthusen to create Prex Gemina, a sound installation for the American Academy in Rome’s show Cinque Mostre. Since the death of her maternal grandmother and birth of her niece last year, Ramgopal has turned her attention to herself with atavistic questions of motherhood and personal legacy with projects like A Half-Light Chorus, a sound installation she created for Experimental Sound Studio in Chicago’s Lincoln Park Conservatory that featured vocalists imitating the calls of birds from India and Sanskrit literature. These projects accompanied multidisciplinary ensemble shows that herald a shift in Ramgopal’s storytelling—one that eschews electronics and synths and embraces the warmth of the sruti box, unprocessed vocals, and performance art and dance. These journeys find a home in Ramgopal’s follow-up to Migration, which is due in 2019. A study in the search for renewal after loss, hope mingles with despair in her new record. In Lykanthea lies the eternal possibility of transformation and rebirth.